Inside: I’ve combined some fun trends to show you how make these easy DIY Painted Concrete Place Card Holders for any occasion! Are you as excited as me for the return of jeans weather? I love summer, but it’s always right around mid August that I start wanting fall to get here. So I decided to get going on some fall decor ideas so that I’m ready. I plan to make a few changes to my fall tablescape from last year. 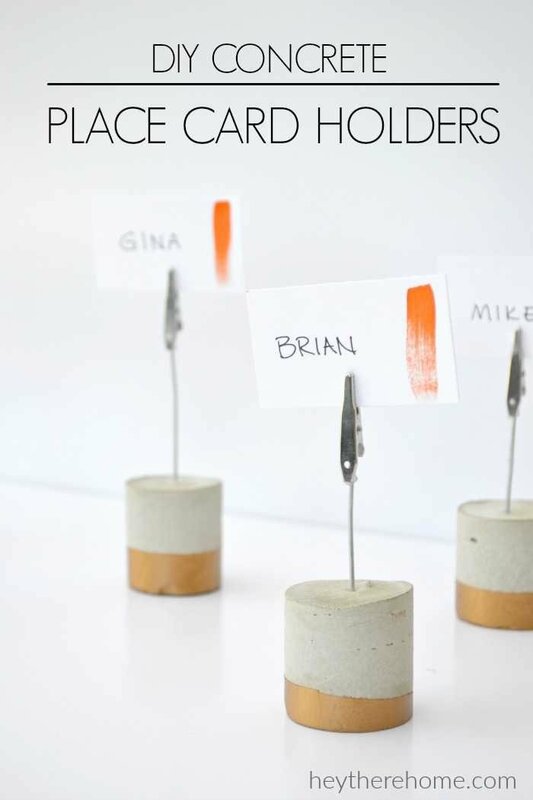 First on my list is to add a few modern elements and since concrete is such a fun trend right now I thought these DIY painted concrete place card holders would be a perfect start. 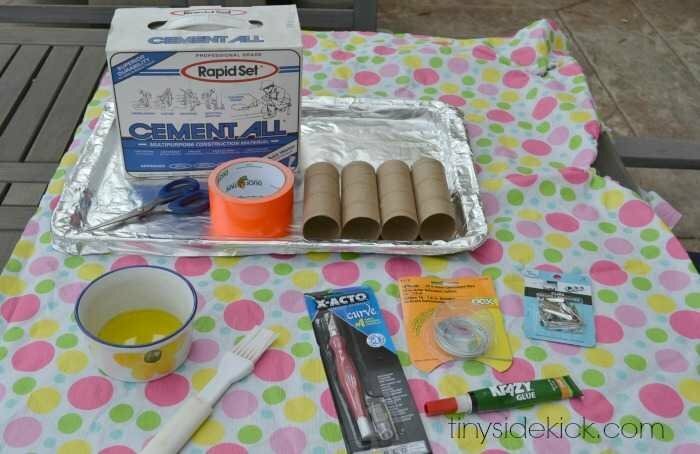 toilet paper rolls: You’ll use these as concrete molds. You’ll need 1 roll for every 2 place card holders you plan to make. an x-acto knife to cut the rolls. Step 1: Cut your toilet paper rolls with an x-acto knife, so that they are about 2 inces tall. I used an x-acto knife so that I didn’t smush my rolls. You want them to be perfectly round. I got 2 molds out of each roll and had a little bit left over from each roll (just to give you an idea of the height of mine). Step 2: Brush a thin layer of oil onto the inside of each roll. Then place it on a piece of tape and fold the edges up, making sure to keep your roll perfectly round. This is going to be the bottom of your place card holder and will keep the concrete from leaking out. Step 3: Cut your wire pieces so that they are ready to place in the wet concrete. You can decide how tall you want them, but keep in mind that you will place them into the concrete all the way to the bottom of your roll. Step 4: Mix your concrete according to the directions. Mine called for 4 parts concrete to 1 part water. I used 3 cups of concrete mix and had to add a bit more water than what it called for to get the consistency right. Tip**: Place your mixing bowl into a trash bag and pull it tight so that when you mix your concrete the bowl is covered in plastic. Mix it with a plastic fork. This makes clean up so easy. Step 5: Using a plastic spoon, fill each toilet paper roll, leaving about 1/2 inch at the top. Give the cookie sheet a little jiggle to get the air bubbles and tap the top of each one with your finger to get it to even out if necessary. Step 6: Insert the wires right away so that they stand up perfectly straight. Set them aside to dry for about 4 hours or until you think they are completely dry. Step 7: Once they are dry, remove the toilet paper roll and give them a light sanding to get the extra paper off and fix any little blemishes that may have occurred. Now it’s time to paint! Originally I was going to use orange since I plan to use these on my fall table, but changed my mind to gold so that I can use them for Christmas or even New Years decor too. Step 8: Tape off each concrete place card holder. I added paint to about the bottom third of each one and did some straight and some diagonal. Just be sure your tape is pressed down really well. I gave them each 2 coats of metallic gold Martha Stewart craft paint and peeled the tape while they were still wet, then set them aside to dry. Step 9: Add your alligator clips. First decide which is the best side of each place card holder and glue your clips on so that that side faces forward. I used Krazy glue, which was the perfect choice here because it is such a small space and it didn’t run at all. 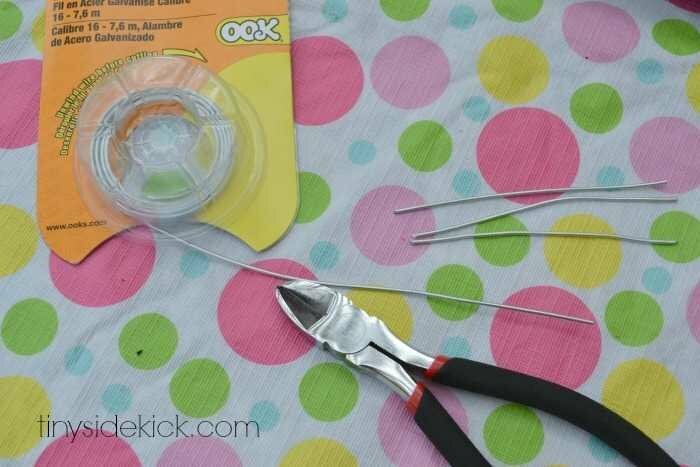 Be sure that you are gluing just one side of the alligator clip to the wire and not getting glue in the spring part of the clip or your clip won’t open. They don’t call this Krazy glue for nothing people! It is strong stuff and it dries quickly so be ready for that. 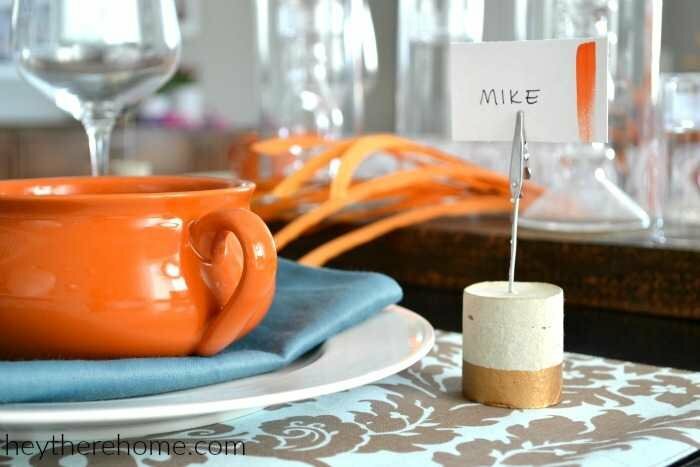 Once they are dry, add your name cards and set the table! I love how these turned out! I’ll admit that when I told my mom about my idea, she looked at me funny, but aren’t they cute? They’re a perfect addition to my modern fall tablescape, and will be great to display photos on shelves or even label food on a buffet! Where did you get the concrete from? Hi Elise, you can buy fast setting DIY concrete for crafts from Joann’s or Amazon. Best wishes! I am trying your project. But I am finding I’m having a problem when taking off the toilet paper roll the cardboard is stuck onto the conrete around the whole thing. Did you have this problem also? I used the same cement and made sure to brush olive oil on the inside before. I just made these for a grad party this weekend. I painted them black and gold. My concrete didn’t turn out quite as pretty (lots of air bubbles). Probably should have added more water. But I think I kinda like them with the air bubbles. I will defiantly be using these over and over again. Love your black and gold color combo, Tina! Thanks for the feedback! Hey Jamey, I used 16 gauge wire. Can’t wait to make these! I will be using them to label dips and sauce at my next party! This is such a great DIY. I’ve never done a concrete project, but this is too cool. Thank you so much for sharing at the Twirl & Take a Bow Party! Have an awesome week! I just pinned. These cuties would fit right in line with the fall dining room design I’m conjuring up. I love the gold band on the bottom for a touch of glam and the orange brush stroke that decorates beautifully! I’m a very new blog writer and just subscribed to your blog. Would you hop on over to my blog, and if you like what you see, subscribe and add a comment? I’m planning on doing the link party next week. Thanks again for sharing this great DIY! Wonderful project! How do the alligator clips attach to the wire? Hoping to make some to use as food markers for my niece’s wedding reception. Hi Mary Jo. I used Krazy Glue to attach the alligator clips to the wire. Just be careful to not use too much glue or the clips won’t open. Let me know if you have any other questions and I’d love for you to send me a photo when you are done! Congrats to your niece! These are so adorable and creative Corey! Love it – featuring you tomorrow at Work it Wednesday. Thanks for sharing it! Funny I was just telling my hubs how brilliant I am! Ha! Thanks Amy! These are way cool! 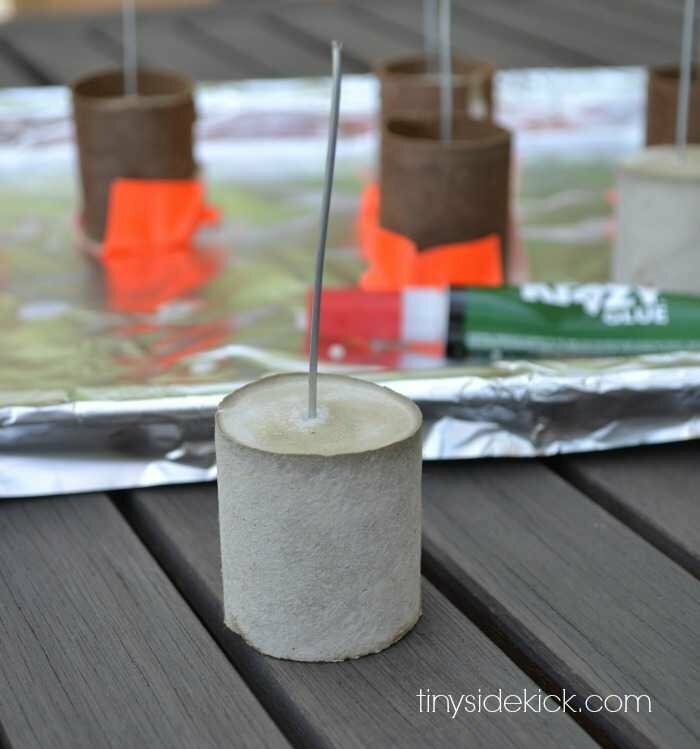 And they don’t seem nearly as intimidating to try out as some of the other concrete DIY’s I’ve seen. Sharing! I was definitely weary of trying concrete, but this little project was totally manageable. Now I think I might be hooked and need to make some planters! I love these! Like want to go buy the stuff and make them on the weekend kind of love, thanks so much for sharing how to make them. These are awesome, Corey! I love the little brushstroke name cards too! I have been working up my courage to enter into *concrete world*! What a perfect way to do it! Thanks so much. This is a definite do. I can think of a hundred uses for these. Well, you’ve sold me. I’ve wanted to do a concrete project forever and now I have no excuse! These turned out so so cute and I love the gold bottom. Pinning. Corey!! LOVE this idea! The gold on the bottom is the perfect touch. Pinning!